Notes: These very showy, poppy-like purple anemone flowers are fine for gardens, cut flowers and make wonderful border plants. 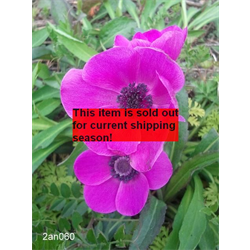 Try these anemone bulbs in pots or window boxes for long lasting colors. If you live in zone 6 or cooler, store tubers over the winter and plant in the spring after last frost date.